Acromegaly is a rare disorder caused by chronic growth hormone (GH) hypersecretion. While diagnostic and therapeutic methods have advanced, little information exists on trends in acromegaly characteristics over time. 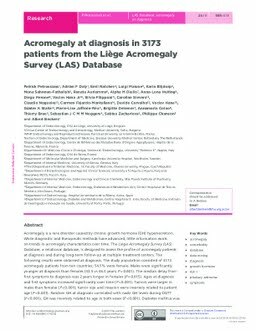 The Liège Acromegaly Survey (LAS) Database, a relational database, is designed to assess the profile of acromegaly patients at diagnosis and during long-term follow-up at multiple treatment centers. The following results were obtained at diagnosis. The study population consisted of 3173 acromegaly patients from ten countries; 54.5% were female. Males were significantly younger at diagnosis than females (43.5 vs 46.4 years; P < 0.001). The median delay from first symptoms to diagnosis was 2 years longer in females (P = 0.015). Ages at diagnosis and first symptoms increased significantly over time (P < 0.001). Tumors were larger in males than females (P < 0.001); tumor size and invasion were inversely related to patient age (P < 0.001). Random GH at diagnosis correlated with nadir GH levels during OGTT (P < 0.001). GH was inversely related to age in both sexes (P < 0.001). Diabetes mellitus was present in 27.5%, hypertension in 28.8%, sleep apnea syndrome in 25.5% and cardiac hypertrophy in 15.5%. Serious cardiovascular outcomes like stroke, heart failure and myocardial infarction were present in <5% at diagnosis. Erythrocyte levels were increased and correlated with IGF-1 values. Thyroid nodules were frequent (34.0%); 820 patients had colonoscopy at diagnosis and 13% had polyps. Osteoporosis was present at diagnosis in 12.3% and 0.6-4.4% had experienced a fracture. In conclusion, this study of >3100 patients is the largest international acromegaly database and shows clinically relevant trends in the characteristics of acromegaly at diagnosis.